Group Size: 16 – Sold Out! To be placed on our waitlist, click here. Road Runner Photography Tours is joining with Magnum Excursions to offer you this safari! Is Africa on your bucket list? Is your goal to capture quality, potentially award winning wildlife photographs? Imagine an African game reserve managed for the conservation of wild animals but developed and focused around the requirements of wildlife photographers. It sounds too good to be true! 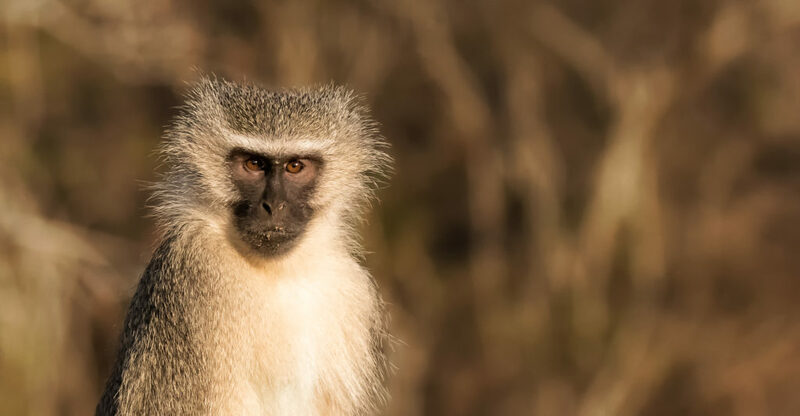 Now imagine that special wildlife photographer reserve with rhino, elephant, lions, Cape buffalo, leopards, as well as cheetah, wild dogs and an impressive 400 plus bird list. WE ARE NOT KIDDING! THIS IS ALL POSSIBLE ON THIS PHOTO SAFARI AT ZIMANGA! If you’re serious about capturing unforgettable images of African wildlife, then you can’t afford to miss Zimanga. Zimanga is Africa’s first private game reserve designed specifically for wildlife photographers, with purpose-built hides offering superb mammal and bird photography, and exciting game drives in pursuit of lion, African wild dog, cheetah, elephant, rhino and more. Zimanga has been developed by Charl Senekal over the last decade. 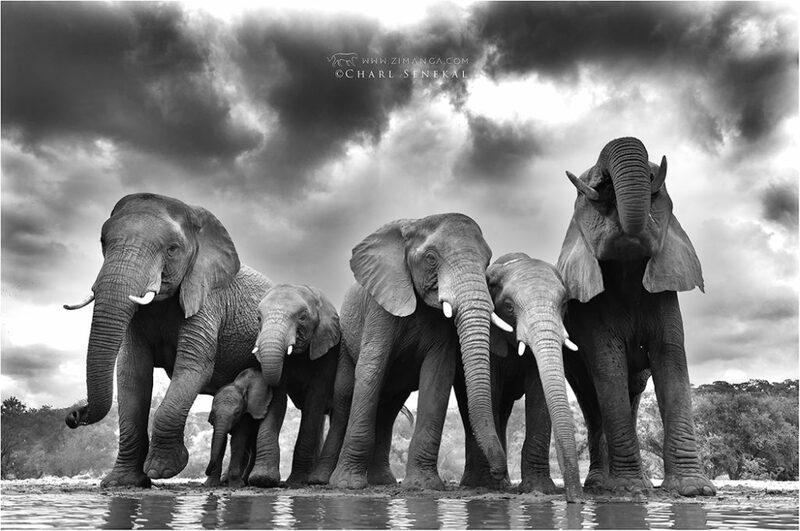 As an avid photographer, Charl has created a photo safari destination like no other. Zimanga, located in KwaZulu Natal, South Africa, is the first reserve in Africa designed for avid safari enthusiasts while simultaneously satisfying the needs of modern wildlife photographers of any level, who prefer a deeper appreciation of the bush and crave an unhurried exclusive experience. It is the intention for Zimanga to become the region’s premier wildlife photographic destination and the owners are committed to the continual development of the reserve, striving to push the boundaries of a new wildlife experience unlike that found anywhere else on the continent. 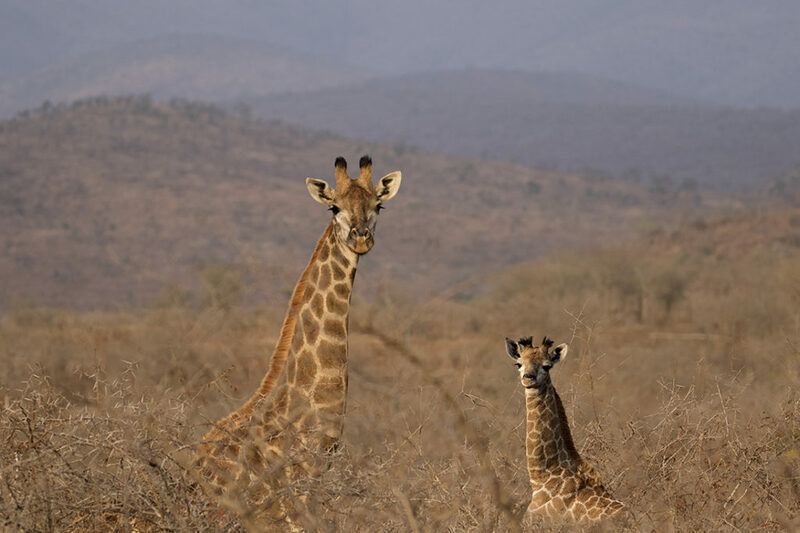 Species including lion, elephant, rhinoceros, wild dog and cheetah roam freely across the region and can be tracked down for unparalleled game viewing and photographic opportunities. There are over 400 bird species recorded on the reserve and its surrounding areas. A lot of reserves have many species so you may be wondering what makes this reserve so different. Specially designed, water level viewing hides: Zimanga boasts the first hides designed in Africa by multi-award winning Hungarian photographer Bence Máté. 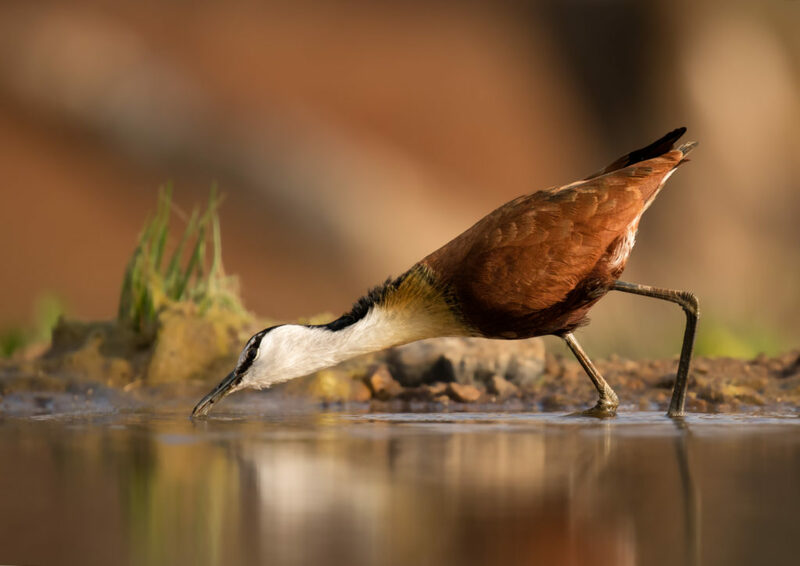 If you don’t know his name, you’ll know his images – he’s won the most coveted prizes in wildlife photography, and with good reason. 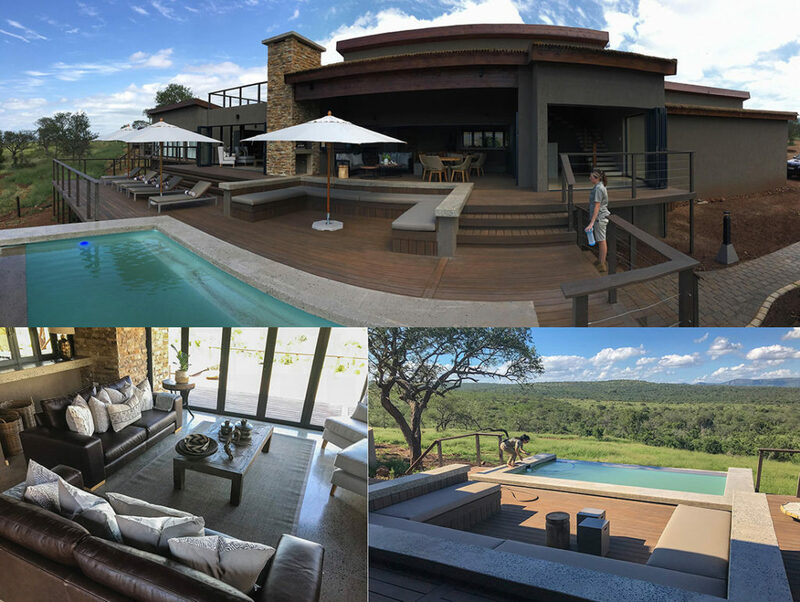 Guests will be able to use all of Zimanga’s world-class facilities with the potential of building up a stunning and varied wildlife photographic portfolio. Nothing beats the excitement and anticipation of sitting in wait at a waterhole during the dry season, knowing that anything can appear …. that is until the development of the Overnight Hide where anything can appear out of the darkness! Land Based Game Drives: we won’t just be ‘hide-bound’, we’ll also be exploring the Big Five reserve by vehicle, in search of great shots of elephant, rhino, lion and much more. Zimanga’s guides use the latest technology to ensure we can find thrilling subjects such as the endangered African wild dog and cheetah, and hopefully we’ll even have the opportunity to photograph some of the most charismatic animals on foot – allowing dynamic low angle viewpoints. Exclusive Use of the Reserve: We’ve arranged exclusive use of the entire reserve. Here is what that means to you:Schedules are flexible – On most safari’s game drives are limited to 3 hours and begin and end a fixed time. Not this trip! We can go out when we want and stay our as long as we want. More Freedom on Game Drives – Normally, it’s a rule that guests must stay on the vehicle at all times. Not on this trip! If our guides deem it safe, you can get out, lay at a low angle beside the vehicle and get the shot. 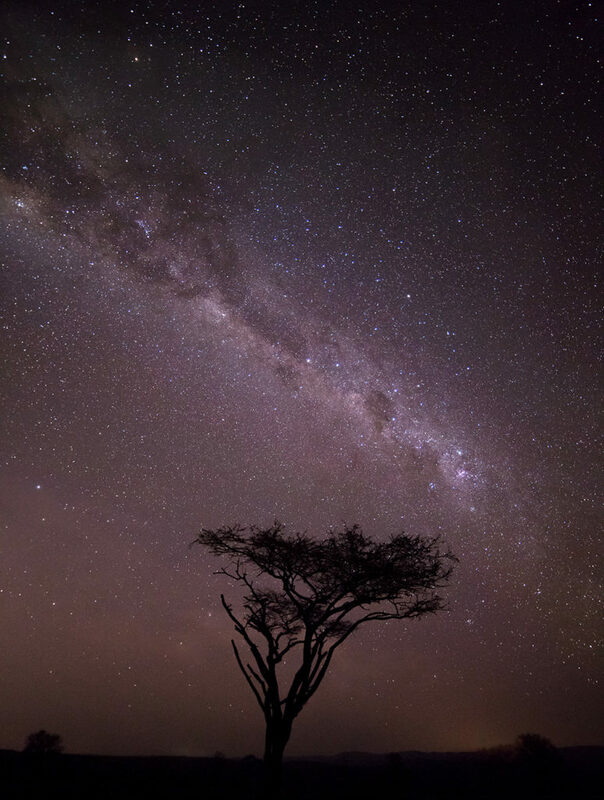 Night Sky Photography – Would you like to go out and shoot the Milky Way or star trails. No problem. It can be arranged. Workshops and Discussions at the Lodge – This lodge was built for photographers. We will be able to share images and discuss your shots in specially designed photography meeting rooms. We’ve visited Africa over 30 times photographing in its game parks, so you’ll be able to tap into our huge wealth of knowledge and expertise. But we’ll also be working with Zimanga’s guides, who know the reserve like the backs of their hands and really understand the needs of photographers – because they work with them every day. These hides are unique in their design and execution in Africa. Bence’s hides have been designed to get you up close to everything from small birds to rhinos to elephants to predators. Two Bird Bath Hides or Reflection Hides. These are ideal for small bird photography. The larger Lagoon hide focuses on water birds and crocodiles in the summer season. 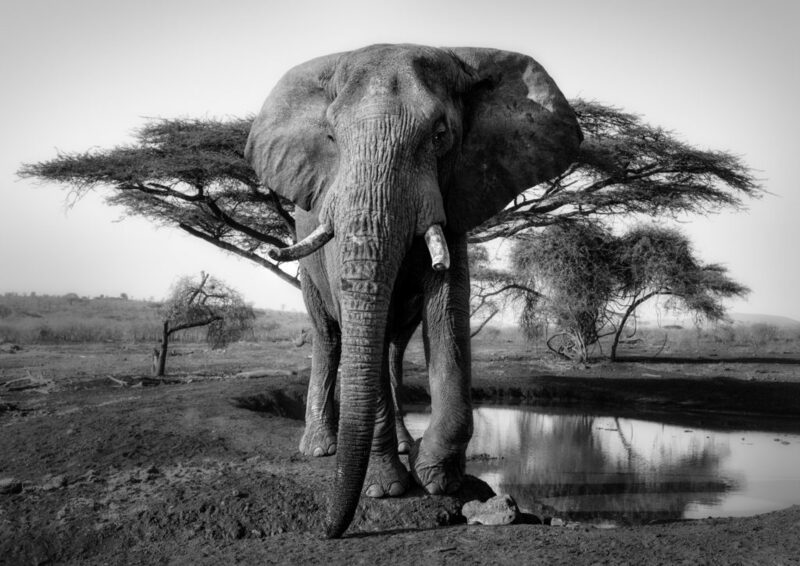 Overnight Hide is custom designed for large mammal photography both at night and during the day. The bee-eater hide is a mobile unit that can be placed in close proximity to where white-fronted bee-eaters nest and produces stunning results for these colorful birds. The Scavengers Hill is situated on a hill looking over a valley and beautiful mountain backdrop, and the action can be fierce as up to 5 species of vultures, alongside other scavengers, compete for food. Please note that the vulture hide is only available should a carcass be obtained. Planning and building hides of this caliber is an exhaustive process. First a location is selected from an extensive short list before a test box is installed and used for several months allowing the design and positioning to be adjusted, often by the tiniest degree, to ensure that the lighting, focal lengths, backgrounds and animal behavior all fall in to place so that the photographers produce images of startling quality and originality. Each of the hides is designed for its potential subject whether it is a large mammal like a giraffe or elephant or the smallest of birds like waxbills and twinspots. The photographers are invisible to their subjects behind specially imported one-way glass so as not to startle the subject with any movements or sounds. Photographers are seated on comfortable executive-style chairs, which glide effortlessly and quietly on across the wood laminate flooring. A solar-powered air conditioning unit situated in the roof of the hide controls the temperature and humidity within. The hides are spacious and soundproofed with carpet on the walls to muffle the sound. The carpets themselves are inlaid with a fine silver thread to eliminate mildew growth in such close proximity to a water source. The hides allow photographers a non-intrusive method of wildlife photography and although the subjects are free-roaming, and hence no sighting is guaranteed, the hides tip the balance heavily in favor of the photographer to get that amazing shot. There are no toilet facilities close by so please limit your intake of drinks during the hide sessions. The hides are dark to minimize reflections from inside and are mostly underground. Please be aware of this if you suffer from claustrophobia. On game drives, we will have no more than two clients per row. This ensures great viewing angles and the ability to take along several lenses. The game drives will be through a mix of open savannah-like areas with umbrella acacia trees and also woodland areas with rich forest settings. From past trips, we can say that this reserve has some of the most impressive elephants we’ve seen. Rhino sightings are also amazing, as are sightings of less well-known species such as Nyala. 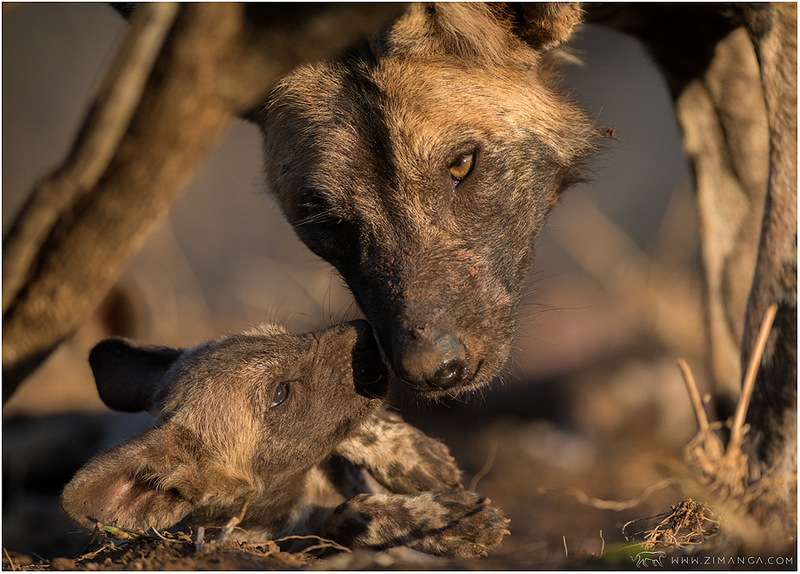 Both the wild dogs and the cheetah are highly habituated and in past trips we have been able to leave the vehicles and photograph these from ground level. The Zimanga Main Lodge will be completed in May 2018. Prior to this, we have had to stay at a lodge located about 4 miles off site. The floor plan of the new lodge includes spacious lounge areas inside the main building, on the decks as well as an elevated view of the valley from the roof lounge. Other facilities include a boardroom, library and quiet lounge attached to the south-eastern wing for those seeking to escape the crowd. The term crowd is loosely used here as the lodge will only sleep a maximum of 14 guests, hosted in six free standing two-bedded units with two additional single rooms, offering privacy within a splendid KwaZulu Natal lowveld setting. Many have asked for more Overnight Hide sessions during their visits, and we listened. The construction of the new Tamboti Overnight Hide is underway and we aim to open this in conjunction with opening the new Zimanga Main Lodge. Please be aware that Overnight Hide Activity can be extremely slow during the low and mid seasons. Please note we will always endeavor to place as few people possible into any Overnight hide, but this will not always work out as such during the busy season or with group bookings when sharing can become necessary. The cost of this all-inclusive safari is $4,950 per person. The same rate applies for each participant regardless of whether they are doing photography and participating in the workshop, or not. This fee includes all in-country ground and air transportation as well as hotel accommodation (double occupancy) and all meals. Single Supplement – $500 -Due to the limited number of spaces available, if a solo guest is willing to share a room and we can match with another guest of the same gender, we will do so. If a solo guest is unwilling to share, then the single supplement fee of $500 will be charged (please contact us if you would like to have your own accommodation as we have to adjust the number of reserved rooms). Deposit and Payment Plan – To reserve your space, a non-refundable deposit of $500 is required. the remaining cost ($4,450) will be split into two equal payments due in November 1, 2018 and February 1, 2019. Necessary Fine Print: Botswana and Zimbabwe are stable countries, but the world is changing and Africa is changing with it. We will attempt to adhere to this itinerary as much as possible. However, certain conditions (political, climatic, environmental, cultural, or wildlife migrations) may necessitate changes in the itinerary. We reserve the right to alter any itinerary at any time, if necessary. We will attempt to notify participants of changes as far in advance as possible. Costs incurred by such changes will be the responsibility of the participant. This group size is good, but space is limited. If this exciting trip fits you, your camera club or you and a group of friends; if you’re excited by the thought of seeing nature while taking your photography to the next level, then now is the time to register. Remember, there will be limited space available for this workshop. When they’re spoken for, that’s it.